I first learned about Debra Dean’s new book, Hidden Tapestry: Jan Yoors, His Two Wives and the War That Made Them One when initially contacted by publicist, Jessica Jonap, about the possibility of reviewing it on my blog. 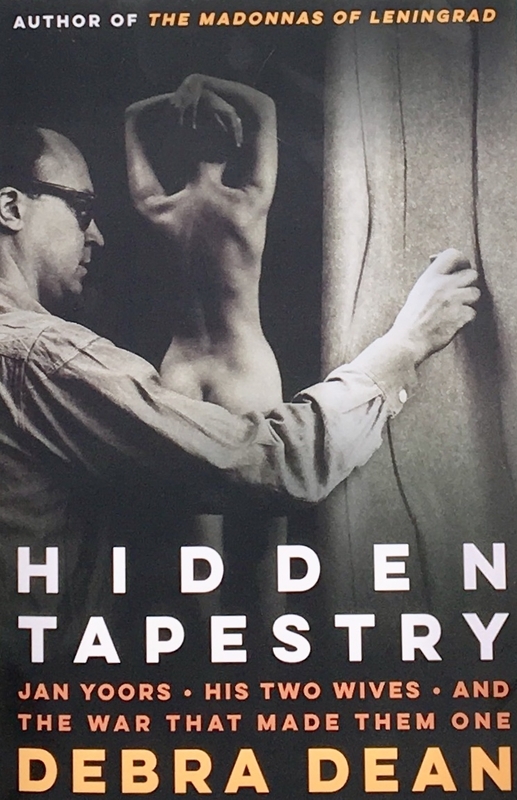 I found it to be an interesting read, well researched, and a good addition to the growing documentation about the Tapestry Art Movement beginnings here in the United States. It is also quite a story of Jan Yoors life, his role in the Resistance of World War II, his wives, Annabert van Wettum and Marianne Citroen, and their lives together in Greenwich Village, New York City during the 1950’s - 1970’s. I was disappointed that there were no large, full color images of any of the Jan Yoors tapestries, which in turn lead me to search out where I could see more of his work. The first version of Carol K. Russell’s Tapestry Handbook (Published by Lark Books, 1990) has one image of “New York Skyline" (p. 60). A recently published catalog is available here, plus a few links to some images: Exhibitions and Collections. I was especially interested to learn more about the beginnings of Paternayan yarn here in the States, with two brothers, Harry and Karinig Paternaya, who were sole survivors from their village in Turkey of the 1915 Armenian genocide. After walking to Palestine, they eventually ended up in New York City and started a business that utilized their knowledge of rugs: importing and dying quality Persian wool yarns. By the time I started working with the crewel weight version of these yarns in the 1989, JCA Corporation in Maine was producing both the Persian weight (three strands plied together) plus a crewel weight (thinner strands) with separate palette of over 250 colors. A mainstay yarn for many tapestry weavers in the United States, it was a devastating blow when JCA shut down all production of Paternayan yarn and closed their business in May of 2012. We were forced to find other yarns. Fleur de Paris began production of its new Anahera line. In 2016 the Paternayan Persian weight became available again, but the crewel weight can only be found when weavers die and their studio inventory is sold. Debra Dean wrote good descriptions of what was required in the production of Jan Yoors’ tapestries: the building of the 15-plus-foot vertical loom, the preparation of the cartoon, the warping of the loom, and the hundreds of hours required for sitting at the loom and weaving. The fact that Jan, Annabert, and Marianne were all self-taught speaks volumes for how the act of weaving can be assessable to those who have the patience for it. Jan Yoors ultimately did not, so relied on his wives to produce his tapestries, which at the beginning were woven in the spirit of collaboration, but less so in later years. Marianne and Annabert Yoors weaving. Photo courtesy of Debra Dean and the Yoors Family Archives. In Hidden Tapestry, however there are some unfortunate errors from the tapestry weaving perspective that need to be corrected, for the sake of accuracy. Jean Lurçat’s last name. the cédille accent below the c is missing. Probably a typo, but this changes the pronunciation from what it should be --“Lursah”-- to “Lurkah.” Referring to the number of “stitches” per inch is more appropriate for needlepoint or embroidery, not hand woven tapestry, where the coarseness or fineness of the weave is described in terms of warp ends per inch, the grain—or bead--of the fabric, or la portée in French tapestry. Indeed, 3 ends per inch of the Yoors tapestries is quite coarse, giving a more textural and chunky quality to the woven surface, compared to French and Flemish tapestries from the Medieval and Renaissance periods averaging around 24 warp ends per inch, which makes for a smoother woven surface. Most disturbing is the perpetuation of the myth that the terms “high warp” and “low warp” also refer to a “high” and “low” quality of weaving based on the use of the vertical or horizontal loom and the likelihood of making mistakes while weaving from the back vs. weaving from the front of the tapestry, as Debra Dean states on page 179. This myth has been around for years, and its origins and veracity are very debatable. It is also debatable which style of loom is older, as the earliest found illustration dates around 5000 B.C. of a horizontal ground loom from Badari. (A similar loom is still in use today by Bedoin nomads). For the record, what does go into the “gold standard” for quality of a tapestry involves the coarseness and fineness of the weave, the integrity of the cloth (sound woven structure), types of yarns used (silk, cotton, wool, linen, strands of gold or metallic threads, etc. ), the compatibility of the design to the language of the loom, the skills of the weaver(s) and the vision of the artist. All of this can be achieved on either the vertical or horizontal loom. I have woven on both haute lice (high warp or vertical) and basse lice (low warp or horizontal) looms. While some of the vertical looms I have used have had foot treadles for changing sheds. I prefer to use a basse lice loom for my larger format tapestries. It does entail weaving from the back of the tapestry, as well as from the side of the design (instead of bottom to top). The loom bench is angled for proper alignment of the back, and my feet can rest easily on the foot treadles, leaving my hands and my concentration totally focused on the weaving process. Weaving horizontally also is ergonomically better for my wrists. I occasionally use a mirror while I work, to check an area before moving on. One can catch mistakes by simply paying attention, regardless of whether one is weaving from the front or the back. Each time I am ready to advance the warp, I will pull back the cartoon and crawl beneath the loom to look what I have just woven. I now also use this as an opportunity to photograph the tapestry’s progress for later viewing on my computer screen. Other reasons for working from the back of the tapestry entail keeping the face of the tapestry pristine and smooth, with no possibility of making the wool weft fuzzy from brushing against it while weaving. Weaving from the back can be more efficient when ending and beginning new colors, and when using specific shading or interlocking techniques. When a tapestry is hung from the side, or by the wefts, the light reflects differently off of the grain of the fabric and the woven image. Tapestry weaving does require paying close attention to detail, and hundreds of hours, as Debra Dean so aptly describes. My tapestry, The Veils of Time, woven at 10 ends per inch and measuring 50” x 60, ” took about 1,200 hours from the designing stage to the warping of the loom, through the weaving, finishing, and preparing it for mounting and hanging. This was all done over the course of twenty-two months, around my teaching schedule and the demands of daily living. The “high stakes gamble” (p.184) of time, money, and resources involved in weaving large-scale, un-commissioned tapestries that the Yoors experienced in the 1950’s continues to be true for tapestry artists today. Just as public expectations, means and misunderstanding around the pricing of a one-of-a-kind hand woven tapestry that the Yoors encountered over 60 years ago still remain, despite the more recent historical exhibitions mounted at venues such as the Metropolitan Museum of Art, the Getty Museum, in addition to the contemporary, juried biennials by the American Tapestry Alliance, and numerous regional and national exhibitions showcasing the art form of tapestry. Tapestry in the United States continues to grow as an art movement. At the time of Jan Yoors death at the age of 55 in November of 1977, on the west coast Jean Pierre Larochette was setting up the San Francisco Tapestry workshop. Coming from a family of Aubusson tapestry weavers who moved to Argentina in the 1930’s, Jean Pierre also had helped Jean Lurçat set up the atelier connected to the Nazareth, Israel Tapestry School after World War II ended. There is where he met his future wife, Yael Lurie, and together they have worked collaboratively over the years, creating many tapestries, mostly for commissions. 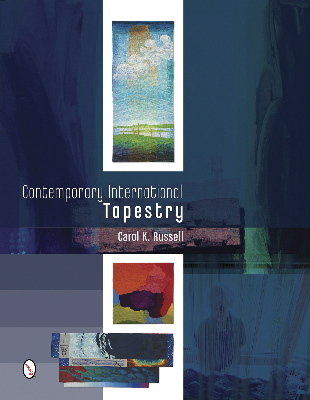 Also during the 1970’s, New York based artist, Gloria F. Ross, was increasing her role as “tapestry éditeur” coordinating American painters and other visual artists, cartooniers (specialists in adapting images for tapestry weaving), dyers, weavers, galleries and their clients in the production of modern tapestries. She worked with ateliers (tapestry workshops/studios) in Scotland, Aubusson and Feletin, France, and later with Navajo weavers here in the United States. In the Midwest, Muriel Nezhnie Helfman was designing and weaving tapestries for public buildings in St. Louis, Missouri beginning in the mid-1960s. In the Southwest, many generations of Pueblo and Navajo weavers had been creating tapestry rugs and chief’s blankets for trade since the 1700’s, in addition to the Saltillo-style blankets produced by Spanish weavers in the Rio Grande Valley from the 19th century forward. Eric Broudy, The Book of Looms: A History of the Handloom from Ancient Times to the Present, Van Nostrand Reinhold Company, 1979, p.14. Ann Lane Hedlund, Gloria F. Ross and Modern Tapestry, Yale University Press, 2010. Kate Peck Kent, Navajo Weaving: Three Centuries of Change, School of American Research Press, Santa Fe, NM, 1985. Evelyn Bingham Prosser “Weaving in San Francisco Part I,” The Weavers’ Journal, Vol. VI, No. 2, Fall 1981, pp.44 – 47. Evelyn Bingham Prosser, “Weaving in San Francisco Part II,” The Weavers’ Journal, Vol VI, No. 3, Winter 1981 – 82, pp.50 – 53. Carol K. Russell, The Tapestry Handbook, Lark Books, 1990, p. 60. Deborah Slater, “Tapestries of Muriel Nezhnie Helfman,” Handweaver & Craftsman, Vol. 23, No. 5, September/October 1972, pp.43 – 45.